In tech publications today, you regularly see articles on building inclusive work spaces for women and removing the stigmas of “brogrammer” culture. Groups like Move the Dial highlight the institutional barriers women face in their tech careers. Essays like the one published by former Uber software engineer Susan Fowler detailed specific offenses, which brought about swift and dramatic change within some of the world’s biggest tech companies. There are regular series dedicated to training managers on how to not become the next Uber. For Bridge’s program leaders, the challenge was not about getting more women into the pipeline, but helping them move further through it. When it comes to technical skills, initiatives often focus on getting more women into the pipeline. The belief is that the earlier you start getting women into STEM (Science, Technology, Engineering, Mathematics), the more likely you are to end up with higher numbers of women in the tech ecosystem. According to the Where is the Dial Now? report by Move the Dial, only 29.6 percent of all women graduates are STEM grads; however, women make up over half of all university graduates. It then makes sense to encourage and motivate girls and women to become interested in STEM. Some start very early, like Canada Learning Code, which has an arm dedicated to teaching school-aged girls on the basics of code. For Bridge program leaders Emily Porta and Lindsie Canton, the challenge was not about getting more women into the pipeline, but helping them move further through it. The program is for women with some work experience in the tech industry, either in design or software development, and a desire to move up in their careers. 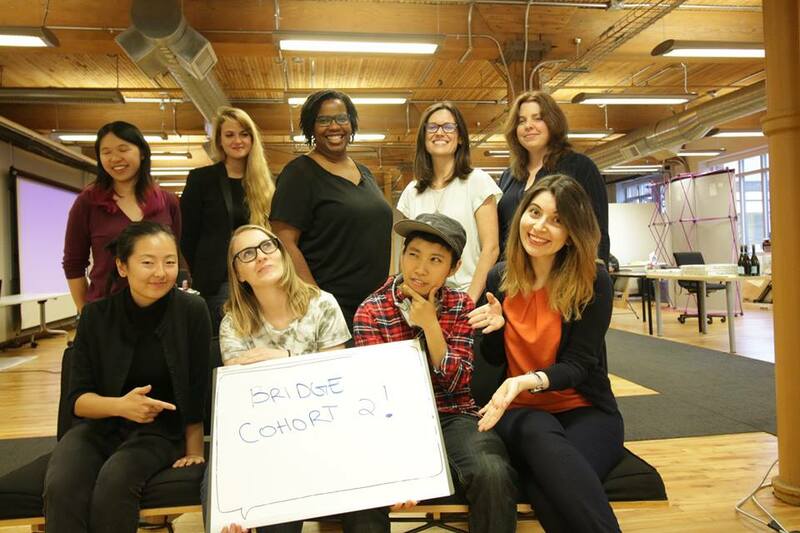 Initially incubated by Toronto development firm Rangle.io, the Bridge program is an initiative to “give women the tools they need to get better jobs in the tech industry, either at Rangle or another tech-related company.” Porta and Canton are now looking to expand the Bridge program to other tech firms in the community. Although its look and feel are similar to bootcamp classes, the Bridge program has small cohorts of 10 to 12 people part-time and an explicit community focus that makes it unique. This way, continued Porta, the women are not only performing specific on-the-job actions, but also gaining leadership and teamwork experience that help them develop the professional skills necessary to advance their careers. Porta is a Scrum Master at Rangle.io, and she put those skills to use founding the original Bridge for Software Developers program. Canton, on the other hand, is a Product Designer, so she spearheaded the inaugural Bridge for Product Designers. “In the product design program, we employ modern pedagogy and we do a lot of interactive workshops,” Canton said, mentioning that the women get both project-based learning and in-class practice. The program is also different from a traditional bootcamp in the sense that Bridge focuses on women who have some prior experience, rather than those looking to break into the industry. In addition, Bridge is free for participants, sponsored by the hosting companies as both a recruiting and community building exercise. A product design graduate presenting. Porta added that Bridge is focused on women in tech not because they can’t find jobs, but because many women in tech struggle to get the job they want, whether that’s a leadership position or just a next-step promotion. With so many organizations focused only on getting people into the pipeline, next-level skill development is often overlooked for folks who don’t have a lot of support or resources coming from their networks. The challenge is worse for women who did not attend more traditional educational institutions. 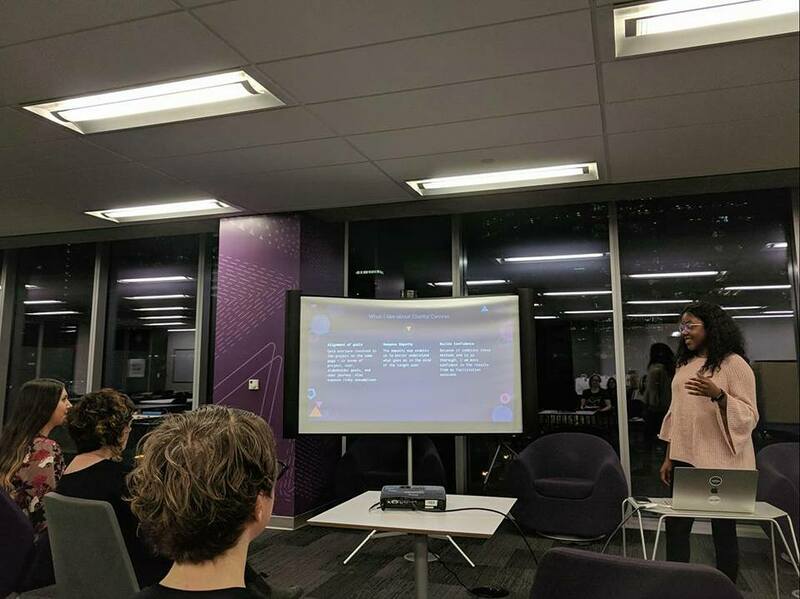 Emily Porta talking about what’s next for Bridge at the DITTO x Bridge event on September 7, 2017. According to Move the Dial’s report, 45 percent of entry level tech workers are women, but only 25 percent of senior tech leaders are women, highlighting the need for support to those further down the funnel. The need for support is clearly desired by the market. Given the success of, and demand in, the initial cohorts – there have been over 500 applicants for the first three – Porta and Canton are now focused on expanding the program to other companies to help more women. Canton explained that the expansion of Bridge is part of what she sees as a necessary shift to multi-layered diversity and inclusion strategies in tech companies. In a good diversity and inclusion strategy, she said, the first layer is basic anti-bias training or standard anti-discrimination policies. The second layer, however, is about taking action. For Canton, the first step for individuals looking to take action is educating oneself on the issues, and explicitly recognizing your privileges. She recommends that anyone who wants to make an impact in diversity and inclusion ask themselves tough questions around what their privileges are and what they may have received because of those privileges. “Whether you are an employee or the CEO, that’s the first step,” Canton said. When a company makes a decision to move forward, its leadership has to step up to the plate and let the organization know diversity and inclusion are critical. When leadership supports groundswell employee actions, initiatives like Bridge spring to life. Canadian tech leaders have echoed similar sentiments about the need for leadership to provide support in these circumstances. Porta and Canton’s goal with Bridge’s expansion is to provide a template that helps organizations get to action faster. They plan to share the Bridge brand, framework, and system with other companies, so they can sponsor and host their own Bridge programs, building off an already-proven product instead of reinventing the wheel. Encouraging leadership to step up is often the rallying cry of any organizational change, but one of the issues that plagues diversity and inclusion-focused initiatives is the lack of traction beyond the organization that founded them. 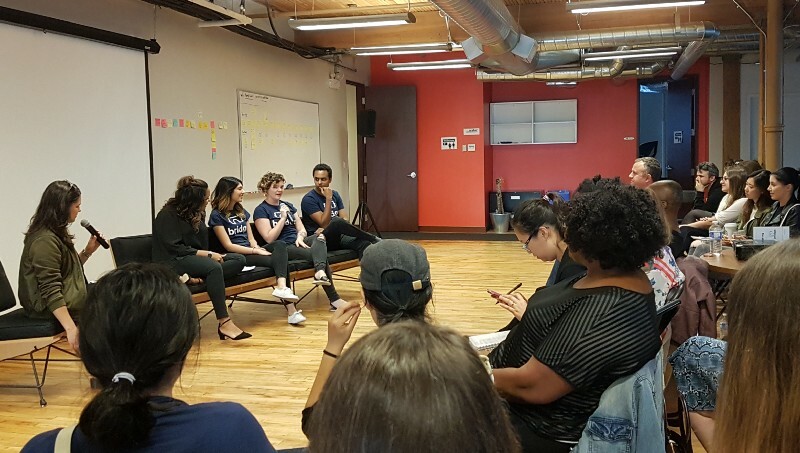 While it’s not a bad thing that organizational diversity and inclusion initiatives help the company that founded them, Porta noted that it’s important to focus on the community you are helping from day one. This means individuals may end up working for other organizations, but Porta and Canton believe the net effect is more positive for the community at large. Applications are currently closed for the next Bridge for Software Developers cohort, but their applications page indicates to follow Bridge on Twitter, Facebook, and Instagram for updates. This article is brought to you by Rangle. Make an impact. Be Disruptive. 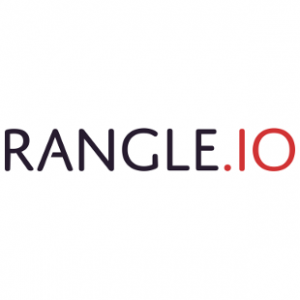 Explore possibilities with Rangle. Diversity and inclusion is about breaking down barriers of Cultural Arrogance and Systemic Blindness within our organizations that have created an employment divide. Bridging the digital divide is about closing the diversity gap of leadership understanding and management implementation of inclusion. Design is the bridge between information and understanding, but for the most part, the design reflects the narrow perception of the designer and unintentionally excludes specific groups of people. the Bridge program is an initiative to give women the tools they need to get better jobs in the tech industry, but how inclusive is it. Product design should consider the communication needs of individuals, through accessible and usable processes and tools. Is the Bridge Program about diversity and inclusion, or about empowerment of a few? Does the processes and tools support women with vision loss? Expanding understanding of digital communications will open the door of inclusion. Just a thought to create greater awareness in the workplace.